This conceptual research stems from the 57-page document released by Elon Musk regarding the Hyperloop project (See PDF here). It addresses in detail a key area of the project that was only briefly described and stated as needing refinement: the Hyperloop Station. 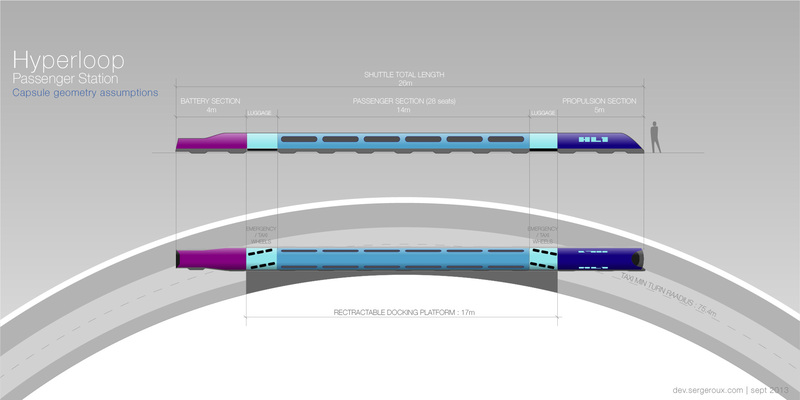 The Hyperloop station depicted here departs from the original suggested design (using parallel platforms and turn tables), while meeting all original requirements of the overall system. This Hyperloop station concept is based on a looped track (heh!) to create an ever-flowing stream of capsules that people can embark and disembark from. The station is a two-story self-sufficient building with a reduced footprint, concentrating all the amenities within a single looped elevated track that circles the outer walls. To account for the peak-hour passenger flow rates, this station allows for simultaneous access to 3 capsules, creating three parallel flows of passengers. Achieving peak flow rates by multiplexing platforms and turntables (initial intent) would requires anywhere from 100% to 200% more footprint depending on implementation. This station makes Hyperloop, well, an actual loop. 1 – Compression. The capsule enters the compression airlock which equalizes the tube pressure with atmospheric pressure. For simplification purposes, this step is scheduled to last 1 minute. 3 – Arrival. 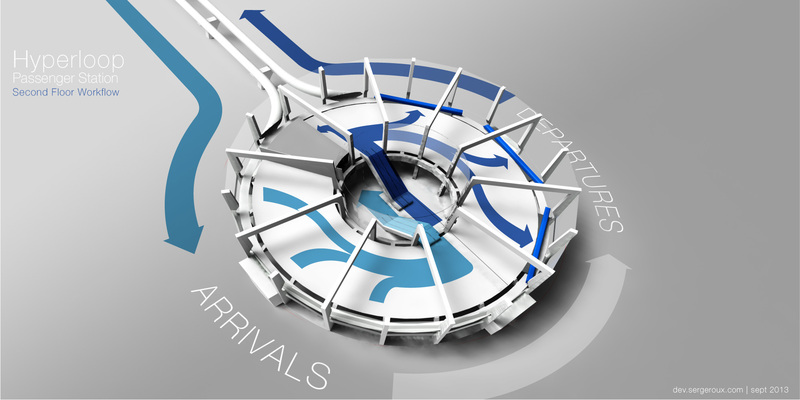 All 3 capsules taxi simultaneously to the arrival terminal (1min), where passengers have 3 minutes to disembark. 4 – Departure. the three capsules then move over to departure, where passengers also have 3 minutes to embark. 6 – Decompression. 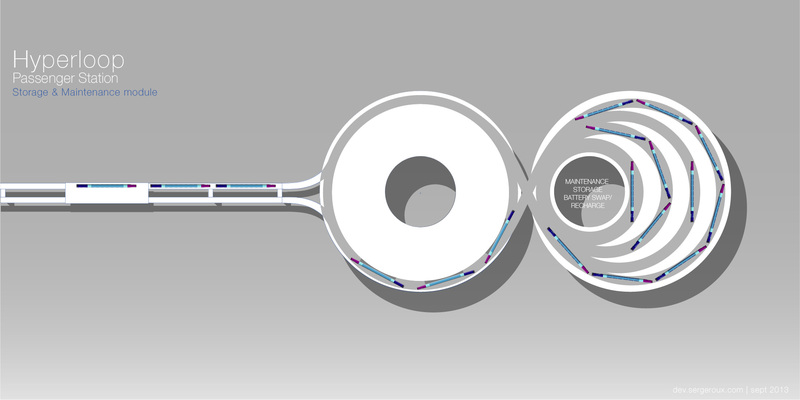 The capsule enters the decompression airlock, which equalizes the tube pressure with the track low pressure. For simplification purposes, this step is scheduled to last 1 minute. With this sequence (not fully optimized), assuming an LA-airlock to SF-airlock time of 30mn, the overall trip from platform to platform lasts an average of 40mn and minimum of 35mn. This amount of overall overhead time is similar or even less than the one needed in a multiplexed station, where one may still have to wait for compression, disembarking, turntable time, embarking, decompression and departure queuing. Optimization of the sequence may be done by diminishing embarking/disembarking time and streamlining buffer times to reduce the overall trip time further more. The passenger Hyperloop station is a truncated cone building in shape that has the footprint of an 85m diameter disc. To put this in perspective, this is roughly the width of the Caltrain station in San Francisco, and about half its length, if you include the airlocks. The disc is also a little smaller than the main Grand Central station building (excluding all platforms). Overall, this makes the design very space efficient for a major commuter hub. The building is 21m high at its apex and composed of 2 floors. 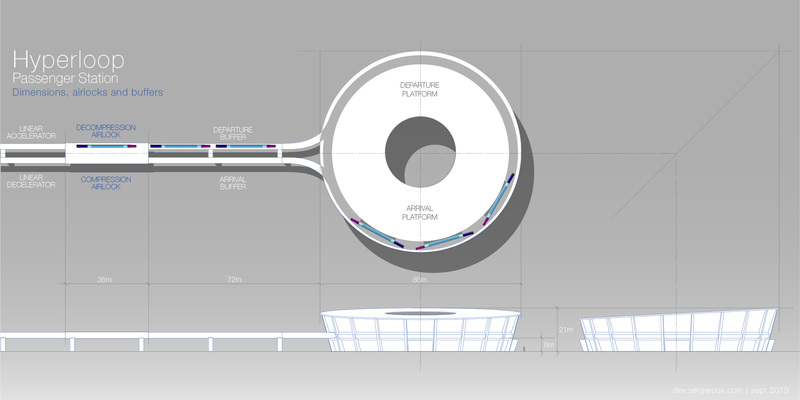 The second floor, located 6m over the ground floor, is aligned with the average pillar height of the Hyperloop track. This floor hosts the arrival and departure terminals, situated on the inside of the disc and separated by a glass divider. The departure terminal is designed to take up a little more space to accommodate waiting areas, book stores and coffee stores. 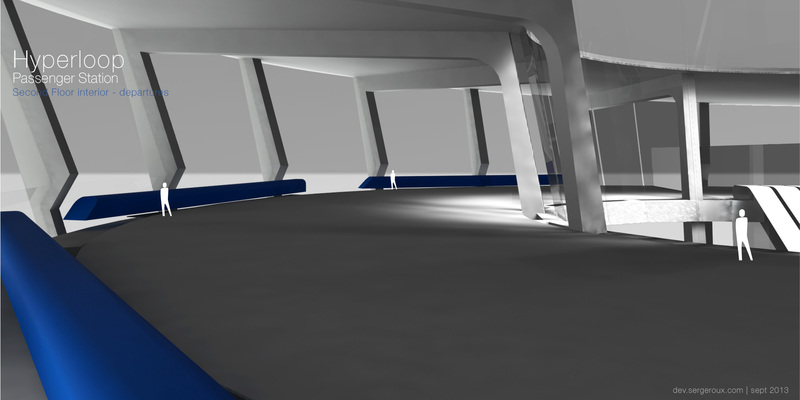 The capsule track loops around the building and hosts 3 docking platforms on both sides, allowing passengers from 3 capsules to embark or disembark simultaneously. 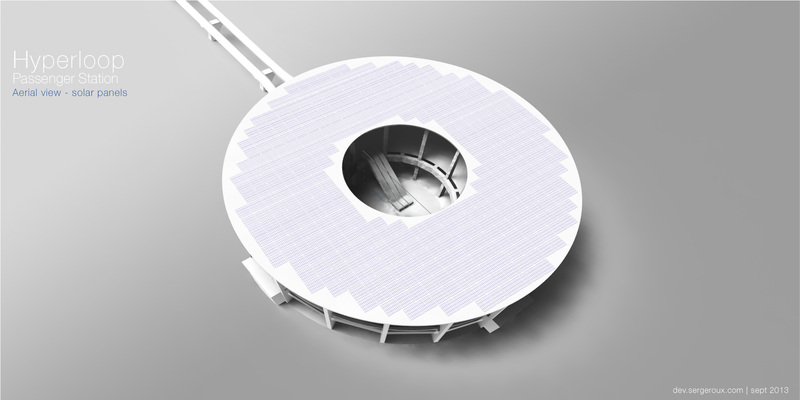 The roof of the building is donut-shaped and covered with solar panels, slanted for optimized sunlight orientation. The electricity generated complements that generated on the tracks, making the station self-sufficient. The circular aperture in the center of the roof allows light to flood both floors through the central well that hosts the escalators. The passenger capsule is assumed to carry 28 passengers (14 rows). For comfortable seating, the distance from seat to seat is assumed to be 1m, which allows ample reclining and the ability to board to the far side from a single-side opening. 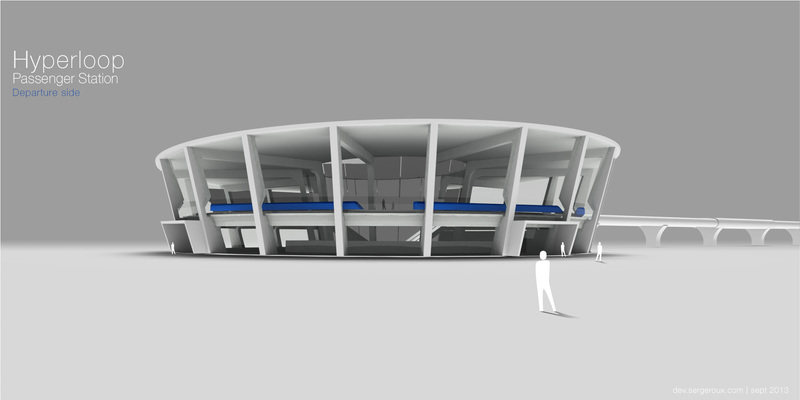 This creates a passenger section of the capsule that is 14m long. Assuming 5 meters for the front compressor and 4 meters for the battery storage in the aft compartment, and 2 x1.5m luggage storage at each end of the passenger section, the passenger capsule is assumed to span 26m in length. This length is critical in the overall station design and turning radius. In order to taxi from the airlocks to the station, the capsules use the wheelbase originally intended for use in-tube in case of emergency. 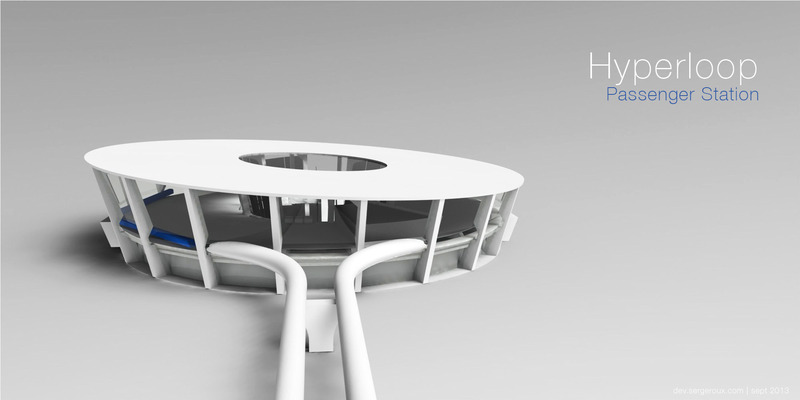 This wheel base, situated well away from the capsules’ ends, allows a turn radius of 75.4m, needed to turn around the station. During taxiing, the capsules can utilize their on-board battery power source, or be ferried by cable or linear motors situated in the station. 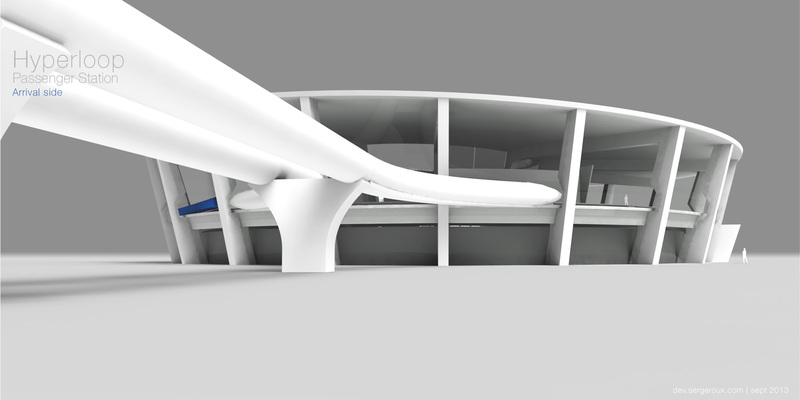 The overall tight curvature of the building, tangent to the capsule straight body, creates a gap between the main arrival and departure floors and the capsules that can be as large as 1.3m. To fill that gap, retractable docking platform extend from the main floor and contact the side of the capsule. Passengers can then safely enter, exit and handle their luggage without fear of falling through the gap. The platforms are retracted when the capsules are in movement. Although there is no obligation for the storage and maintenance of the capsules to be collocated with the station, it may make sense to do so in order to limit the number of airlocks and pressure failure points as well as allowing the swift evacuation / replacement of a disabled capsule. The passenger and vehicle station can be derived from this configuration, but may have to augment in size to allow for a larger tube. Furthermore, it may be effective to lay the station loop on the ground floor, to facilitate embarking and disembarking of cars. 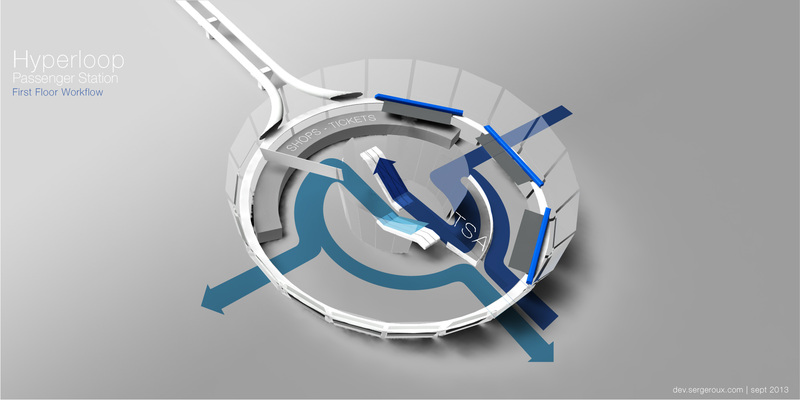 Alternatively, entry and exit ramps nested inside the structure could lead the vehicles to the second floor, entering the capsules the same way cars enter Le Shuttle (vehicle counterpart to Eurostar) to transit between France and Great Britain under the Channel.